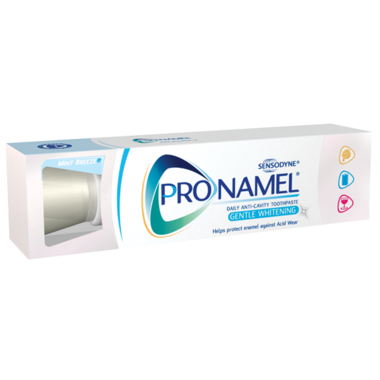 Pronamel® Gentle Whitening is a daily anti-cavity toothpaste that has been specifically formulated to help protect teeth from acid wear. Pronamel® Gentle Whitening helps reharden and remineralize acid-softened enamel, making it stronger and more resistant to future acid attacks. Unlike many other whitening toothpastes, Pronamel® Gentle Whitening is effective without using harsh abrasives. It has been specially formulated to gently yet effectively remove stains to restore teeth to their natural whiteness. Cleans teeth. Reduces painful sensitivity. No issues with flavour etc. Does what it's supposed to do without tasting too awful. Have been using this product for years because it works. This toothpaste is a bit expensive, but it does seem to help with my sensitive teeth. Also, I have no idea why all toothpaste tubes aren't made like this one. It works better than your typical tube, where you end up having to curl the end of squeeze the tube using the flat end of your toothbrush. I have a couple very sensitive teeth and my dentist actually reccomended I use this product. After I started to use it the sensitivity prectically went away, the only time it comes back is if I stop using it. Sensodyne does what claims. I always feel the sensitivity come back after a couple of days of not using it. I also find this brand nicer to use than others out there (flavour, texture). I had a sensitive spot on a back molar and since using this product it has gone away. Great tasting and smooth on my teeth. i like sensodyne toothpastes because they do help with the sensitivity. this one doesn't taste very nice compared to the others i've tried, its a very bland off kind of mint. This product is great for anyone with teeth sensitivity and weakened enamel. My dentist highly recommended this and I have been using it now for about 6 months or so! Great product. The taste isn't too strong, so you can easily drink OJ after brushing your teeth. I'm not sure if it does what it advertises (strengthening the enamel) but my dentist says it does!